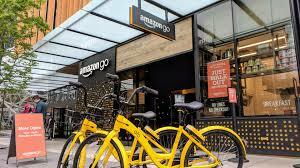 Amazon Go stores, which let customers buy items without waiting in checkout lines, will start accepting cash, amid intensifying criticism that the company is discriminating against the unbanked, who account for 6.5% (8.4 million) of U.S. households. Amazon has added to its site, including a pilot that accepts government subsidized SNAP benefits and a new program called Amazon Cash, which lets users add cash to their digital accounts by bringing money to a local store like 7-Eleven or CVS. The company is considering opening up to 3,000 cashierless stores by 2021. Kessel highlighted some of the new payment methods Amazon has recently added to its site, including a pilot that accepts government subsidized SNAP benefits and a new program called Amazon Cash, which lets users add cash to their digital accounts by bringing money to a local store like 7-Eleven or CVS. "We're in earlier days but it's an important focus for us and we'll continue to extend those methods with our stores," Kessel said at the meeting, a recording of which was heard by CNBC. Kessel didn't provide a time frame for the changes or specifically say what the company will do.